Cohort studies can be classified as prospective or retrospective based on when outcomes occurred in relation to the enrollment of the cohort. 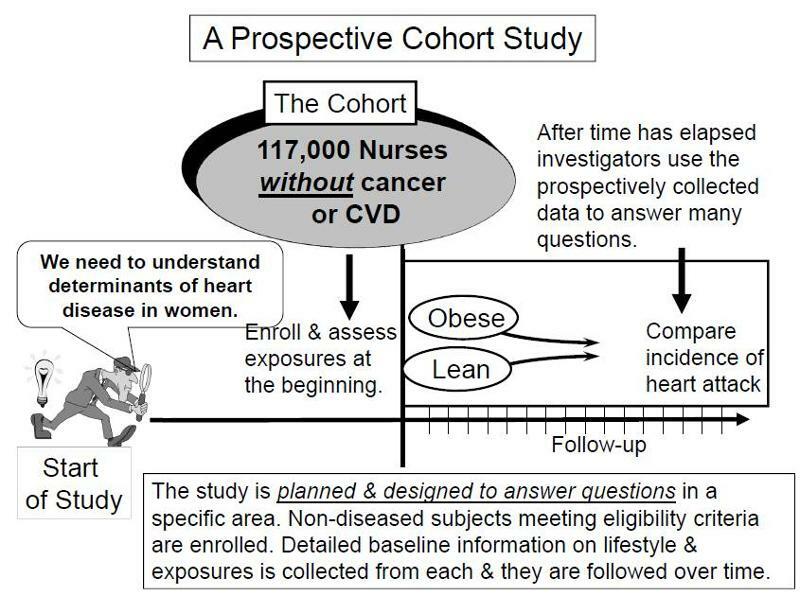 In a prospective study like the Nurses Health Study baseline information is collected from all subjects in the same way using exactly the same questions and data collection methods for all subjects. The investigators design the questions and data collection procedures carefully in order to obtain accurate information about exposures before disease develops in any of the subjects. After baseline information is collected, subjects in a prospective cohort study are then followed "longitudinally," i.e. over a period of time, usually for years, to determine if and when they become diseased and whether their exposure status changes. In this way, investigators can eventually use the data to answer many questions about the associations between "risk factors" and disease outcomes. For example, one could identify smokers and non-smokers at baseline and compare their subsequent incidence of developing heart disease. Alternatively, one could group subjects based on their body mass index (BMI) and compare their risk of developing heart disease or cancer. Key Concept: The distinguishing feature of a prospective cohort study is that at the time that the investigators begin enrolling subjects and collecting baseline exposure information, none of the subjects has developed any of the outcomes of interest. Pitfall: Note that in these prospective cohort studies a comparison of incidence between the groups can only take place after enough time has elapsed so that some subjects developed the outcomes of interest. Since the data analysis occurs after some outcomes have occurred, some students mistakenly would call this a retrospective study, but this is incorrect. 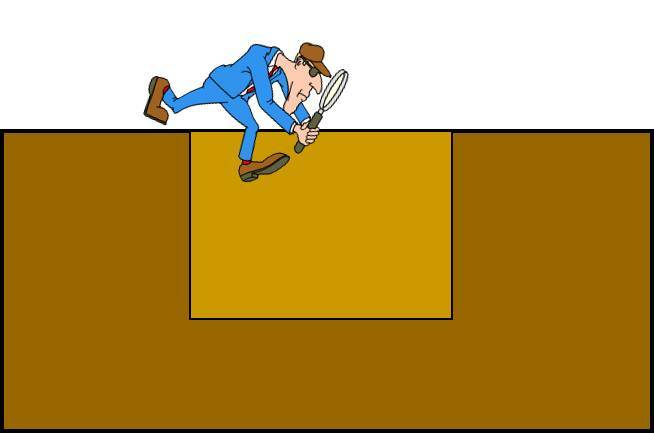 The analysis always occurs after a certain number of events have taken place. The characteristic that distinguishes a study as prospective is that the subjects were enrolled, and baseline data was collected before any subjects developed an outcome of interest. In contrast, retrospective studies are conceived after some people have already developed the outcomes of interest. The investigators jump back in time to identify a cohort of individuals at a point in time before they have developed the outcomes of interest, and they try to establish their exposure status at that point in time. They then determine whether the subject subsequently developed the outcome of interest. Suppose investigators wanted to test the hypothesis that working with the chemicals involved in tire manufacturing increases the risk of death. Since this is a fairly rare exposure, it would be advantageous to use a special exposure cohort such as employees of a large tire manufacturing factory. The employees who actually worked with chemicals used in the manufacturing process would be the exposed group, while clerical workers and management might constitute the "unexposed" group. However, rather than following these subjects for decades, it would be more efficient to use employee health and employment records over the past two or three decades as a source of data. In essence, the investigators are jumping back in time to identify the study cohort at a point in time before the outcome of interest (death) occurred. They can classify them as "exposed" or "unexposed" based on their employment records, and they can use a number of sources to determine subsequent outcome status, such as death (e.g., using health records, next of kin, National Death Index, etc.). Key Concept: The distinguishing feature of a retrospective cohort study is that the investigators conceive the study and begin identifying and enrolling subjects after outcomes have already occurred. Retrospective cohort studies like the one described above are very efficient for studying rare or unusual exposures, but there are many potential problems here. Sometimes exposure status is not clear when it is necessary to go back in time and use whatever data is available, especially because the data being used was not designed to answer a health question. 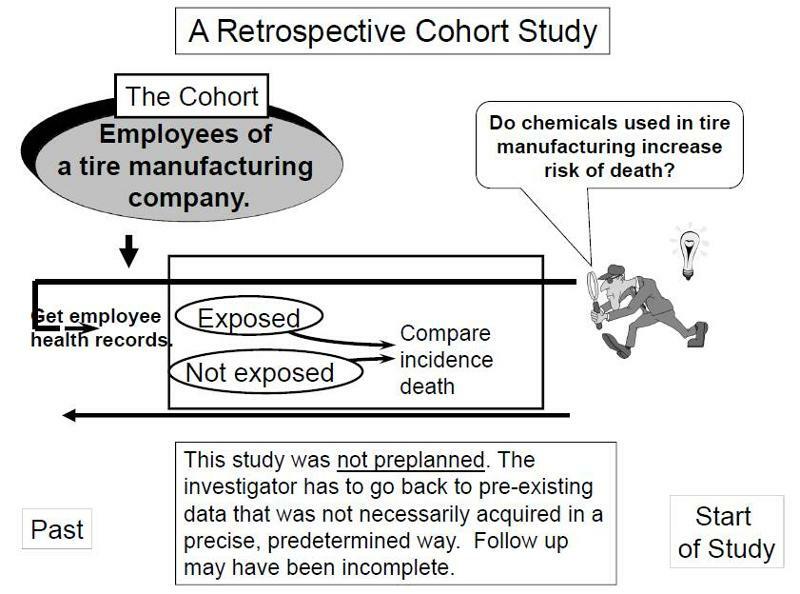 Even if it was clear who was exposed to tire manufacturing chemicals based on employee records, it would also be important to take into account (or adjust for) other differences that could have influenced mortality, i.e., confounding factors . For example, it might be important to know whether the subjects smoked, or drank, or what kind of diet they ate. However, it is unlikely that a retrospective cohort study would have accurate information on these many other risk factors. The video below provides a brief (7:31) explanation of the distinction between retrospective and prospective cohort studies. Intervention studies (clinical trials) are experimental research studies that compare the effectiveness of medical treatments, management strategies, prevention strategies, and other medical or public health interventions. Their design is very similar to that of a prospective cohort study. However, in cohort studies exposure status is determined by genetics, self-selection, or life circumstances, and the investigators just observe differences in outcome between those who have a given exposure and those who do not. In clinical trials exposure status (the treatment type) is assigned by the investigators. Ideally, assignment of subjects to one of the comparison groups should be done randomly in order to produce equal distributions of potentially confounding factors. Sometimes a group receiving a new treatment is compared to an untreated group, or a group receiving a placebo or a sham treatment. Sometimes, a new treatment is compared to an untreated group or to a group receiving an established treatment. For more on this topic see the module on Intervention Studies. In summary, the characteristic that distinguishes a clinical trial from a cohort study is that the investigator assigns the exposure status in a clinical trial, while subjects' genetics, behaviors, and life circumstances determine their exposures in a cohort study. Key Concept: Common features of both prospective and retrospective cohort studies. The groups being compared differ in their exposure status. One measures and compares the incidence of the outcome in order to determine whether there is an association between the exposure and the outcome. Date last modified: July 19, 2017.